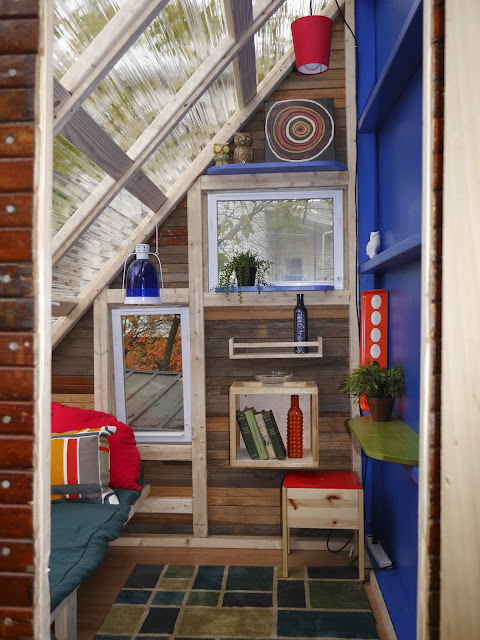 Relaxshacks.com: Deek's NEW Wildly-Colorful Boston Tree House/Cabin- AND TWO MORE! Deek's NEW Wildly-Colorful Boston Tree House/Cabin- AND TWO MORE! MORE COMING SOON- but here's a sneak peak on the tree house I just built for a client- we shot a full video on this as well- showing how I used a ton of recycled and free materials in the build.... This is another micro structure that will be featured in the wild array of tiny houses, cabins, tree houses, and forts in my new in-the-works book. LOTS of photos, and FULL PLAN SETS in this next one- from some great guest designers too! I ALSO WILL HAVE FRAMING PLAN SET FOR THIS VERY SOON- if interested, email me at kidcedar at gmail dot com.